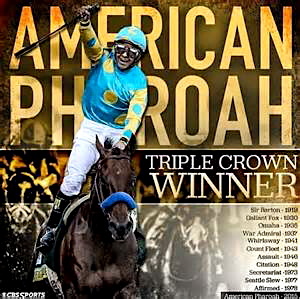 I have to admit I missed the Belmont Stakes on June 6, when American Pharoah secured his third and final victory in the Triple Crown series of horse racing. I had him winning in my trifecta for the Kentucky Derby on May 2, and watched impressively as American Pharoah easily won the Preakness Stakes at Pimlico in Baltimore on May 16. But I was in Jamaica getting engaged when the Belmont was run, and horse racing from New York just didn’t hit the radar in Montego Bay. In the back of my mind I knew the Belmont was running that day. Growing up in Kentucky, whether you care for horse racing or not, it’s part of your DNA. Due to geographical proximity to Churchill Downs in Louisville, residents of the Commonwealth have little choice but to take note of the Triple Crown races. There are Derby parties everywhere, the Governor has hundreds of guests over to his mansion in Frankfort on the first Saturday in May for a country ham and biscuit breakfast, and even at work it’s hard to escape casual betting pools on the Derby outcome. Even if you don’t know win-place-show from a superfecta, folks here have an appreciation for the running of the ponies. Not to mention, if you attended the University of Kentucky, the spring meet at Keeneland might as well be a core course requirement of study. You will learn how to bet at least well enough to pay for your cocktails. This Belmont was different than any I remembered previously. Twenty-three horses have won the Kentucky Derby and Preakness Stakes, with nearly half, 11, going on to win the Belmont. American Pharoah had the feel he would become the twelfth. His owner, Ahmed Zayat, was referential about his horse’s success and was humbled to be along for the ride. Pharoah’s trainer, the unflappable Bob Baffert, exuded calm and confidence. Plus this horse ran so strong. His competition in the first two races appeared discouraged at Pharoah’s speed and endurance. It’s still a bit of a crapshoot at the Belmont because it’s the longest of the three races, and many horses that have won the first two jewels come in fatigued. The horse racing industry doesn’t always help itself by allowing in horses to the third race that didn’t run the first two, whereby distance specialists can enter and steal the thunder from horses that have been tested heavily in the previous two races. An interesting comparison that always stuck with me in relating how difficult it is to win the Triple Crown is that 12 men have walked on the moon (a pretty rare occurrence we all would agree), but only 11 horses in history had won all three races of the Triple Crown. Make that 12 after American Pharoah won the 1 1/2 mile Belmont Stakes by 5 1/2 lengths, becoming the first winner since 1978, ending a 37 year drought. It wasn’t even close. 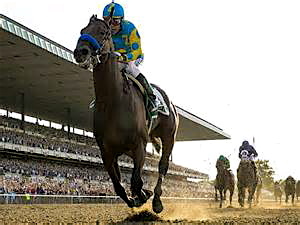 At 43, American Pharoah’s jockey, Victor Espinoza, became the oldest jockey to win the Triple Crown. This entry was posted in Events, News, Travel and tagged American Pharoah, Belmont Stakes, Kentucky Derby, Preakness Stakes, Triple Crown. Bookmark the permalink.